1 of 6 Unwrap block of ice cream from wrapper. Cut block crosswise into thirds; return two-thirds to freezer. Working quickly, cut other third of block like loaf of bread into 8 equal slices, about 1/2 inch thick. 2 of 6 Using spatula, transfer 4 pieces of ice cream to parchment or waxed paper lined baking sheet. Gently press wooden stick lengthwise onto half of each piece, extending one end for handle. Top each piece with another ice cream piece to make bar, lining up edges. Cover with parchment paper or plastic wrap. Place baking sheet in freezer until firm but not solid, about 1 hour. 3 of 6 Repeat with other two-thirds of ice cream block and remaining wooden sticks. 4 of 6 Finely chop almonds. Place in shallow pie plate or dish. Remove wrap from bars. With spatula, lift bars into dish; press chopped nuts onto sides and edges. Re-cover bars with wrap. Freeze until firm, for about 2 hours. 5 of 6 In second shallow dish, combine chocolate and shortening. Microwave on high power for 2 minutes. Stir until mixture is blended and chocolate is completely melted. 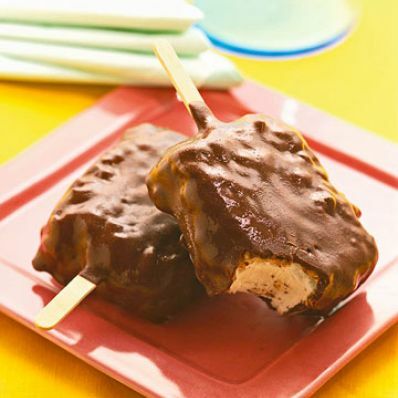 If chocolate is not completely melted, microwave 30 to 60 seconds more, then stir the mixture again. 6 of 6 Remove wrap from ice cream bars. Working with one bar at a time, quickly dip a bar in the chocolate mixture, using a spoon or rubber spatula to cover all exposed nuts. Return bars to freezer as you dip them. Chocolate should harden almost immediately. Freeze for 2 hours. Serve, or store in resealable plastic bags in the freezer. Per Serving: 25 g sat. fat, 4 g fiber, 70 mg sodium, 659 kcal cal., 12 g pro., 58 g carb., 50 g Fat, total, 33 mg chol.